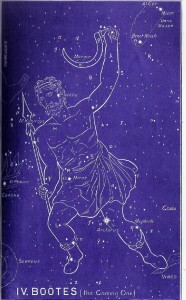 We will see an exact representation of this Seed Promise later in OPHIUCUS and SCORPIO, but for now, it is interesting to note that any pictorial representation found in the star chart of Christ in a position held after his death and resurrection will always be of a man kneeling, as if injured in the foot (heel). This is reinforced by one particular star in this constellation. Notice the very last star name mentioned in the box. The ancient Hebrew name for the star called Merga is actually translated bruiser! The sickle that Bootes holds is fascinating in respect to the Scriptures quoted at the top of this page. Take a moment to read all of Revelation 14:14-19. Christ Jesus is seen in John’s vision as one like a man holding a sickle. An angel encourages the Lord to thrust in his sickle and reap his harvest of souls. What an amazing correlation between this ancient star revelation and the written Word of God concerning the future fulfillment of prophecy. Jesus Christ is indeed the Lord of the Harvest the One who, with “his sons” (believers) will inherit all of creation. Only by his willingness to suffer the ridicule of the religious hypocrites of his day (and their contemporary disciples of today) could He become the “first-fruits” of the new creation. He then becomes the true “Lord of the Harvest.” One of the most important aspects of the gospel is the truth concerning the Lord’s suffering. In Bootes is seen the fulfillment of the great “Seed Promise.” The promise that one would come who would suffer some brutality and yet would ultimately defeat Satan. Because He is able to fulfill this prophecy, He becomes Lord of the Harvest, reaping the great reward of the souls of those He loves. 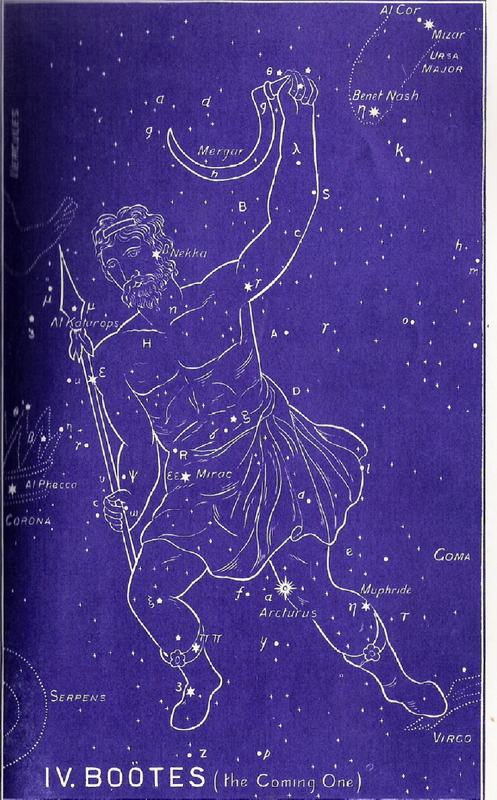 To continue in the correct order of the ancient star chart, please select Libra next.